If you are a brilliant gemstone lover, you may enjoy checking out all the tempting images out there on the Internet. There are so many wonderful websites to visit where you can get your daily fix of bling things. From birthstones to royal jewels to magnificent fakes, I myself can spend hours looking at rings, earrings and bracelets online. If I dare log in to Pinterest, I am doomed to spend hours drooling over estate diamonds, fiery CZ rings and anything else that sparkles. Have you noticed just how many types of stones there are that make for beautiful rings? I have a cute Swarovski crystal solitaire ring that shines in the sun like a more expensive stone. I own Rhinestone cluster rings, Aurora Borealis rings, genuine diamonds and a few pretty Cubic Zirconia designs. The one gemstone that I don’t have is a Moissanite. Naturally, you cant have a website like this without doing a bit of research on diamond alternatives. When window shopping for a engagement ring designed using a real-looking gemstone substitute, you can’t help but notice Moissanite as an option. What Is Moissanite And Where Does It Come From? Although the word Moissanite has that ring of “synthetic chemical” or man-made gems from a lab, it wasn’t originally. 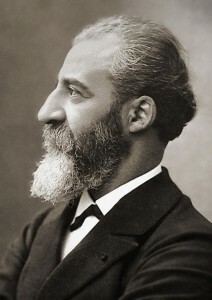 The original gem is named after the man who discovered it, Henri Moissan. Mr. Moissan was digging around on an Indian reservation at the meteor crater named Canyon Diablo in Arizona way back in the late 1800’s. He was taking rock samples when he stumbled upon what he thought were diamonds. What he found was the mineral silicon carbide. After careful inspection and many scientific tests later, the mineral/gems were discovered to be close to diamonds in hardness, but were unique to diamonds in their own right. The Moissanite gemstone name was born. Unfortunately, there is not enough naturally-occurring silicon carbide mineral deposits to supply the worldwide demand for its use. The good news is that Moisssanite is now created in labs to supply the world with these brilliant diamond alternatives. Because Moissanite is considered an extremely top-quality replica of a diamond when it comes to clarity, color and hardness, it can cost much more than a Cubic Zirconia or other synthetic diamond product. Like everything else we buy, things can seem expensive or budget-friendly depending on what we are comparing them to. 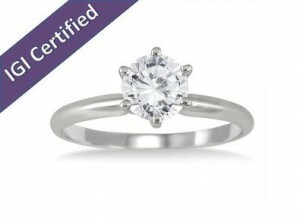 Compared to the price of a 1 Carat CZ solitaire on a real gold band, Moissanite is much more expensive. However, when we compare Moissanite with a real diamond, we can see that it costs hundreds less. What’s amazing is how similar the two rings look in the above photos. Clouds belong in the sky, not inside your engagement ring. If you had your choice between a tiny, flawless Cubic Zirconia ring or a huge, inexpensive low-grade diamond with lots of inclusions, which would you prefer? Decades ago, I made that decision. During my engagement, my fiance took me to the jewelry store to look at diamond engagement rings. There were tiny, flawless ones and huge flawless ones that were out of the budget at the time. In my haste and greed, I ended up choosing a 2 carat marquise cut solitaire design. It was affordable because it was a low-grade diamond. Instead of going for a small perfect stone, I wanted a big one. That decision cost me dearly. As soon as we left the bright lights of the jewelry store, my ring lost its sparkle. It was the dullest, most un-brilliant diamond I have ever worn. If I cleaned it like crazy and wore it next to candlelight, it barely shimmered. 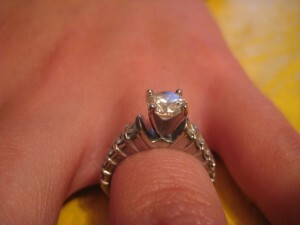 I should have chosen a small, but 100% flawless stone with captivating fiery brilliance. Today’s quality of Cubic Zirconia gems beat my dull, lifeless diamond solitaire by a mile. Why Are Moissanite Engagement Rings Popular? 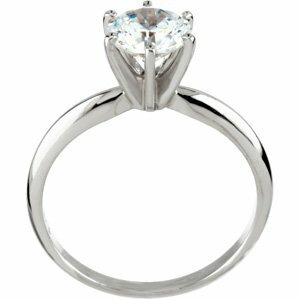 Moissanite is an attractive diamond alternative because of the hardness of the stone. They are designed with as much as finesse and attention to detail as diamonds costing thousands more. They do cost hundreds more than a CZ ring of the same design, but much less than a diamond. They are sparkly, brilliant and fabulous; what’s not to love?